With the ante-post betting for the Grade One Smurfit Kappa Champion Hurdle thrown wide-open following the victory of Go Native at Newcastle on Saturday, owner Andy Stewart is hoping that Celestial Halo can enhance his claims for more Festival glory with victory in the £150,000 Grade Two Boylesports.com International at Cheltenham on Saturday, December 12. The valuable contest is one of the leading trials for the showpiece two-mile hurdle at The Festival in March and the feature of the second day of the prestigious Boylesports International. Last season’s race, run at Ascot due to waterlogging at Cheltenham, saw Binocular beat Celestial Halo by four and a half lengths. Both horses re-opposed in the Smurfit Kappa Champion Hurdle earlier this year to fill the places behind Punjabi, who defeated Celestial Halo by a neck, with a head back to Binocular in third. Punjabi is also due to make his return to action in the Boylesports.com International over two miles and a furlong. 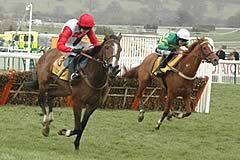 The Paul Nicholls-trained Celestial Halo, successful in the Grade One JCB Triumph Hurdle at The Festival in 2008, kicked off the current campaign with an impressive 10-length verdict over Mamlook in the Grade Two Elite Hurdle at Wincanton on November 7. Stewart revealed today: “Celestial Halo is on course for the Boylesports.com International. We have been very pleased with him since Wincanton and I was surprised that he managed to clock such a fast time off top-weight there. The runner-up may have been out of the handicap but he looked well-treated based on his second on the Flat in the Cesarewitch. “We just hope that there will be a bit of pace at Cheltenham and it is not falsely run like the Fighting Fifth Hurdle was on Saturday. Go Native is no slouch - he won the williamhill.com Supreme Novices Hurdle at The Festival - but I was very surprised that Binocular didn’t find anything on a track that should have been ideal for him. It was a bit of an upset but let’s hope that there isn’t another at Cheltenham. Stewart is also set to be represented in the other highlight on the second day of the Boylesports.com International, the £150,000 Grade Three Boylesports.com Gold Cup, with the Nicholls-trained pair of Poquelin and Gwanako featuring among the 45 entries for the handicap chase over two miles and five furlongs. Poquelin could make his third consecutive appearance at Cheltenham. He landed the zeturf.com Handicap Chase in good style at The Showcase and found only Tranquil Sea four and a half lengths too strong in the Grade Three Paddy Power Gold Cup at The Open on November 14. Gwanako may also return to Prestbury Park after coming fifth behind Imperial Commander in the Grade One Ryanair Chase at The Festival last season. On his latest start, the six-year-old was in the process of running a big race when unseating Christian Williams at the penultimate fence in a Grade Two chase at Ascot on November 21. Stewart added: “We could run one or two in the Boylesports.com Gold Cup. The ground went against Poquelin in the Paddy Power Gold Cup but he still ran an excellent race. The Boylesports.com Gold Cup is run on the New Course, which hasn’t been watered, so that gives us an enormous advantage this time around. “Gwanako is our other potential runner. He was full of running at Ascot and he had Voy Por Ustedes beaten. He probably wouldn’t have beaten Albertas Run but he could have come second if he hadn’t unseated. If the ground gets very soft, then Gwanako will take his chance instead. Ghizao, owned by Stewart and fellow leading jump owner David Johnson and also trained by Nicholls, may make his eagerly anticipated debut over hurdles at the Boylesports International in the two mile, one furlong EBF National Hunt Novices’ Hurdle (3.35pm), the final race on the first day of the meeting, Friday, December 11. The five-year-old Tiger Hill gelding followed up a comprehensive debut success in a Newton Abbott bumper in August with another eye-catching display at The Open on November 15, beating the well-regarded Lidar by six lengths in the Listed Griffins Richard Davis Awards Standard Open National Hunt Flat Race. Steward commented: “Ghizao is a possibility for the EBF National Hunt Novices’ Hurdle on the first day of the Boylesports International. Once he got the beating of Lidar, he had a pretty easy race at The Open, but Alan King’s horses haven’t been running too well at the moment. Friday’s card also features the £50,000 Listed Neptune Investment Management Handicap Chase (1.50pm) over an extended three miles, one furlong, which was won in 2008 by subsequent John Smith’s Grand National hero Mon Mome.